Mung Sprouts Salad is a delicious snack or side dish; the lime juice and spices give it a snappy fresh flavor and piquancy perfect for a quick pick-me-up. Mung Sprout Salad is a version of Indian street fare. Although the salad can be made simpler without the veggies, we love the colorful and flavorful additions. The wonderful thing about this is that while amazingly satisfying, it is not a calorically dense food; so enjoy without guilt :D.
We enjoy the fresh and crunchy sprouts any time of the year but particularly in the summer when we love lighter foods. It is quite similar to the Sprouted Bean & Lentil Salad, Kale Bhel Salad and Chundal/Sundal. Sprouting beans, peas, lentils, or seeds makes their nutrition more available and easier to digest. Most bean, pea, and seed sprouts are also edible raw; exceptions are kidney beans, pintos, and limas - usually all big beans need to be cooked until well done. Sort, soak, and sprout the whole mung beans. Sprouting may take 2 or 3 days depending on the weather. During warmer months, they sprout pretty quickly. Toast the raw peanuts in a dry skillet until fragrant and golden without getting too brown; peanuts which are blanched or with skins are fine. Pour into a plate to cool completely. This maybe done ahead of time and the toasted peanuts stored in an airtight container. Fresh mung sprouts are mild flavored, delicious and fine to eat raw. 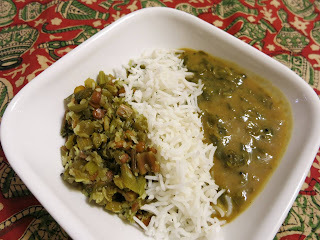 But if you prefer, bring about 3-4 cups of water to a boil; add salt and the sprouted mung and cook for about 3 minutes. Drain, add cool water and a few ice cubes to stop the cooking and drain well again. Tip the sprouts into a mixing bowl along with the radishes, carrots, red onion and cilantro. Sprinkle the black salt and squeeze half the lime over the salad; sprinkle with a little cayenne. Add the cilantro. Mix well. Taste and adjust salt, lime, cayenne, etc. The salad is best when freshly made. The component veggies and herbs maybe prepared ahead of time and kept chilled in the fridge; add salt and lime juice just before serving. Top with the peanuts just before serving. The salad maybe served in small bowls or plates, with romaine or endive leaves to scoop, or spooned into the sweet mini peppers. Tzatziki (zat-zee-kee) is very similar to the Indian Raita. It never ceases to amaze me that so many wonderful ideas are shared among the various cuisines of the world - imagine meeting the familiar raita in Greece :)!! Other cuisines also have similar salad or dip recipes. Only a couple of the ingredients are different; both are delicious! Raita or Tzatziki, both maybe served with a meal or as a starter or dip with some fresh warm flat breads. Persian, English or hot house type of cucumbers have thin skins and need no peeling. Garlic is first minced finely; then using the flat side of the knife, mash by dragging while pressing down the knife back and forth over the garlic until finely macerated. If you prefer to not use tofu, a plain unflavored non-dairy yogurt maybe used; if using non-dairy yogurt, it does not need processing. Just add the yogurt along with all the other ingredients and mix well. Tofu Yogurt: Place the tofu and salt in the bowl of a food processor fitted with the metal blade and whirl until smooth; scoop into a bowl. Squeeze the excess fluids from the cucumbers with your hands, discard the fluids (or add to your water for a refreshing beverage), and add cucumber to the tofu yogurt. Add the ingredients of choice to the yogurt except the olive oil or cumin; mix well. Serve the Tzatziki with the olive oil drizzled on top and Raita with ground cumin sprinkled on top. That's it! Serve or chill until ready to serve. Wow, no fat added in this luscious Aloo Gobhi - an all time favorite dish you can enjoy guilt free! Roasting leaves one free to do other things. If you wish, Aloo Gobhi maybe cooked on stove top; cook in a skillet or Dutch Oven with a tight-fitting lid on low heat until the veggies are tender and then uncover to finish cooking for the moisture to evaporate a bit so the veggies are not soggy. I usually serve Aloo Gobhi with roti, rice or other grains and a bean dish like Dal, Rajma, Dal Makhani, or Chole and some type of a chopped salad. Delicious! Variations: Add colorful sweet peppers, carrot slices, and/or peas - whatever is in the fridge or suits your fancy at the time. Place the cauliflower, potatoes, and onion along with the ginger in a large bowl. Add the spice mix and toss well to coat. Let sit for about 10 minutes - this allows the salt to draw some of the moisture in the veggies and lets the spices coat and cling to them. Start heating the oven to 400 degrees F while the veggies are resting. Prepare a large rimmed baking pan and line with parchment paper to fit. Toss the veggies to mix well and tip them onto the pan and spread evenly. Bake until the vegetables are tender, about 30 - 40 minutes. Check occasionally, stir to cook evenly and add a little sprinkle of water if necessary to keep the vegetables from drying out too much. Alternatively, cover the veggies with a same size baking pan for the first 10 - 20 minutes so they don't dry out but are moist. Sprinkle the garam masala over the veggies, stir to combine, and bake uncovered for another 10 minutes or until the veggies are tender. Remove Aloo Gobhi from the oven when done and mash a few of the potato pieces with a fork. Sprinkle the crushed Kasoori Methi and the chopped cilantro and mix gently; let rest covered for about 10 minutes. Serve hot garnished with cilantro. Enjoy!! Taro Stem Thoran is a delicious side dish to go with any type of Indian stews made with lentils or served by itself with rice, other grains or breads. I like to roll it up in a roti burrito fashion for a lovely snack or lunch on the go. If I do not have enough taro stems, I like to add kale or chard (silver beet) stems, their leaves or diced zucchini, also. Beet greens and stems are great too. This time added chard stems. I used very mild green chiles, New Mexico Chiles - the plants were gift from a neighbor :)! The taro and chard were homegrown as well. If using dried coconut, use unsweetened. Trim the taro stems and remove the strings like a celery by lightly peeling. Slice the stems in medium slices or chop into small cubes. Heat a skillet with the oil and add mustard seeds, the dals and red chile; when mustard seeds subside popping, add green chile, curry leaves, and the taro stems. Stir well, cover and cook over moderate heat for about 20 minutes or until soft and cooked well. Sprinkle the ground cumin and the coconut on top and stir and cook until hot. 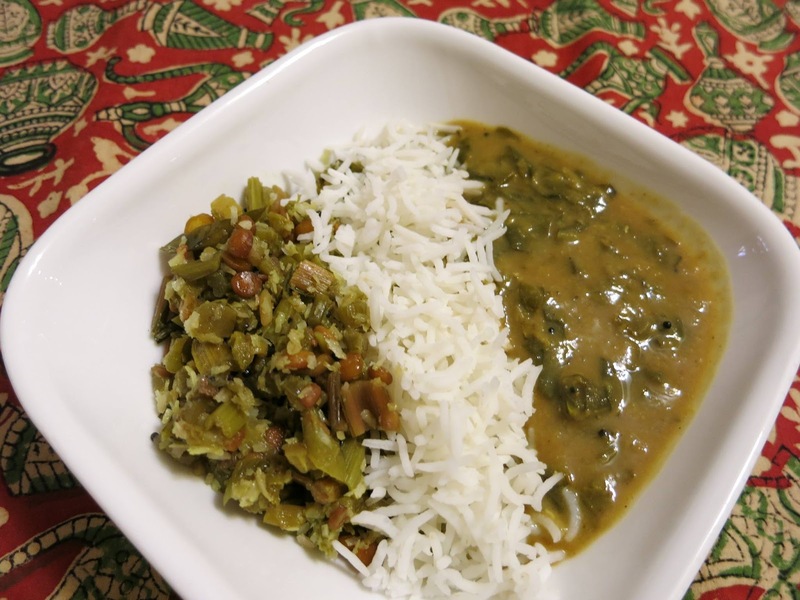 Remove from heat and serve hot with rice or other grains and sambar, a dal or bean dish. Burgers are popular with or without a bun piled with all the traditional additions of lettuce, tomato, pickles, onions, etc or tucked inside the pockets of pita breads with your favorite fixings for a very satisfying meal. Black Bean Burgers are not exceptions; they are fabulous additions to the comfort food repertoire. I like serving these burgers on crisp shredded Romaine lettuce along with avocado slices, tomatoes and onions with some fresh salsa, tomato chutney or tomato sauce for topping. The burgers may be made a day or two ahead and grilled with a little barbecue sauce to warm them. These burgers are not as tough as the store-bought ones and hence need to be handled gently while cooking and grilling. I used crushed tortillas and added a bit of organic rolled oats to bind; the tortillas add to the southwest flavors along with the spices. Whole grain bread or cracker crumbs may be used if you don't need to go gluten-free. Two 15 oz cans of black beans maybe used instead of cooking your own. If you use canned beans, you may not need too much salt as they typically have lots of it already. Extra burgers maybe frozen for up to 3 months. Sort, soak and cook the black beans with the bay leaf and whole dried chiles until soft. When cool enough to handle, remove and discard bay leaf and chiles and drain while still warm; reserve the broth for mixing to make the burgers if needed or add to soup. Beans maybe made 1-2 days ahead and reserved in the fridge or frozen upto 3 months. Process the corn tortillas if using into coarse crumbs; spread on a plate and let dry while preparing the rest of the ingredients. Shred/finely chop carrots, beets, garlic and peppers using the food processor. Scoop into a large bowl. If using home-cooked beans, drain and reserve the cooking liquid. Mash the beans using a potato masher or use a food processor to mash them coarsely with a few pulses. Add the other burger ingredients including the chopped/shredded carrots and beets except the scallions and cilantro and pulse a few times just until combined. If the mixture is too soft, add a little more oats and pulse a couple of times to incorporate. Turn out the mixture into the bowl. Fold in the scallions and cilantro; taste. Adjust spices and seasonings. Chill the bean mixture for about one or two hours or overnight if possible. Form the bean mixture into eight equal patties (or make more smaller ones) and cook them in a skillet or griddle lightly brushed with oil over low-medium heat until on both sides are browned - about 5-6 minutes per side.